Hot, delicious tacos are a wonderful thing. Not having to walk any farther than the parking lot of your work place to enjoy one is even better. Wesley Holton makes such toothsome dreams possible for RDW readers. Holton is the owner, operator and chef behind Jacques Tacos, a gourmet taco truck making the rounds in metro Detroit. Holton uses unconventional main ingredients (by some taco enthusiasts’ standards) to create vibrant, delicious taco-inspired fare for hungry customers. And that patience and creativity is generating some of the best tacos around, truck or no truck. Who else is going to serve you up some fresh tacos with braised short ribs (prepared en daube-style with bacon, orange zest, fennel and coriander)? Or a lamb taco paired with goat cheese mousse, pickled radish and candied pistachios and grapes? And for first-time visitors who come to the truck expecting greasy ground beef in a corn shell with some cheap, dry, shredded cheese? Holton’s resume is no joke. A Schoolcraft graduate, he has worked high-end kitchens in New York City, Palm Beach, Fla., and most recently, as executive chef at the Wynn in Las Vegas. He is also Michelin-rated (a rating system recognizing elite chefs worldwide). An executive chef moving here to operate a taco truck? That sounds a little like Dale Earnhardt Jr. moving to downtown Detroit to become a cabbie. What gives? Via Facebook, Twitter and word of mouth, popularity began to spread, after the mid-summer 2010 launch. Business has remained steady, that is, until the snow started flying. Another short-term goal is to expand evening hours. 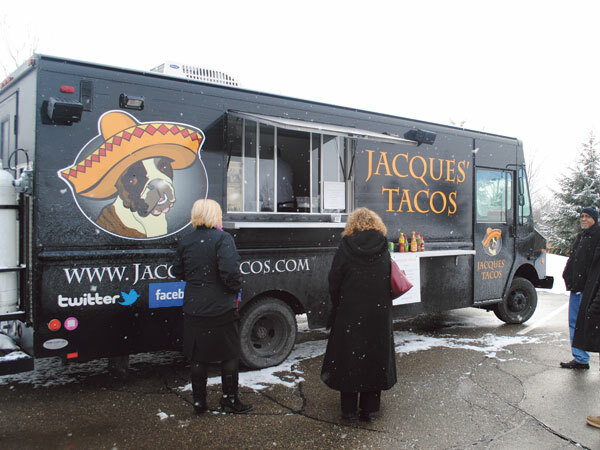 Presently, the Jacques Taco truck is available in afternoons. Holton is hoping to keep bar crowds nice and full after they’re done with a night on the town. Still, his vision remains long-term.